Today is my anniversary. 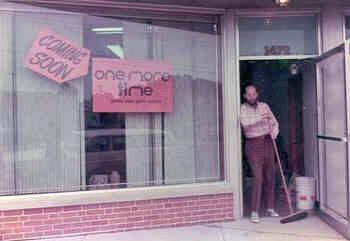 On September 23, 1975, I opened One More Time, gently-used good clothes, in a blue-collar neighborhood of Columbus Ohio. Doesn’t seem that long ago. That’s my father, there, with the broom. He also painted my “coming soon” sign (which went upthe literal MINUTE I signed the lease) and was the owner of the Ford station wagon (1969 vintage if I remember correctly) that’s reflected in the shop windows. I had, in reserve that September day, all the money I had in the world (less than 3 months’ expenses for the shop); a father and step-mother willing if necessary to feed me; a boyfriend willing if necessary to pay my apartment rent; and a whole lotta moxie. I talked the landlord into taking half the rent for the first 6 months, then taking 1 1/2 the rent the remaining 6 months of the lease. Figured (correctly) that would help my cash flow. Now one thing you have to realize is: back then/ there: NO ONE had a clue as to what consignment MEANT, yet alone how it worked. A whole buncha time was spent explaining the whole idea. By me, in between everything else! Dressing room? I replaced the door to the storage closet tucked under the staircase that led to the upstairs offices with “saloon doors”, swinging half-height shutters. Layaways? In the bathroom. 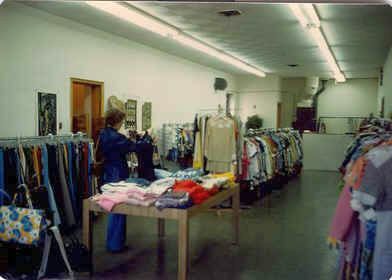 Which I had to WAIT to use (remember, I worked alone) until a friendly pair of local secretaries (Nancy the blonde and Mary the brunette) stopped by every lunch-hour to relieve me for 5 minutes!Excited to start your own shop? Check out TGtbT.com’s Start-a-Shop Page, and get The Manual! A part of any profits I made, those first few months, went to the Grandview Cab Co. because my old red-and-black Toyota often refused at 8am to transport me from my German Village apartment to my Grandview Heights shop. Yes, my parents fed me more often than not (my step-mother made her charity festive by bringing me lunch disguised as a “shop picnic”… her AMC Gremlin would pull up outside and my taste buds would perk right up), but The Boyfriend never did have to help out with my living expenses (and yes, he’s STILL The Boyfriend). A year after opening, I had two (very) part-time employees (both of whom became full-timers and stayed on for 8-9 years longer) and I was able to buy a house. A modest house, yes, but houses should be modest. Twenty years after I opened the shop I sold the business to my manager of ten years and retired at the ripe old age of 48, only to start a career as the web hostess of Too Good to be Threw, TGtbT.com (as you can see, I thought the name was too good to be threw as well!) One More Time is still growing and prospering under the guidance of Chris, who not only succeeded at shopkeeping, but who fulfilled a dream of hers: to serve as president of the industry association! So if you doubt you can make a success of a small (mine started out at 750 sq ft) shop on an even smaller budget, remember me, way back when people didn’t even understand consignment! Get the Manual. The best expenditure your consignment, resale, or thrift can make, at any stage in your business growth. Wow!! I don’t even knew how old this post is but you are so positive and inspirational. I love it😊 keep up then spirit sister!! If you’re observing that people walk right in and walk right out… your job is to find out WHY. You mention layout… are your best-sellers, most appealing goods immediately visible without their going into your other rooms? Are the best sellers touchable? How about lighting? Temperature? Smell? Sounds? Depending on what you sell, 759 sq feet should be enough to get started with… and speaking of what you’re selling, is it merchandise that would be something those vacationers and visitors are likely to be interested in? I tried to see a little about your shop in order to perhaps be able to suggest some things, but your FB URL is incorrect, and the only shop by that name on FB is in the UK. Are you using my Manual, which has helped tens of thousands of shops to be successful? There’s also dozens of more Products for the Professional Resaler which focus more narrowly on specific areas of concern. Im so excited you responded! I am trying to save up to get the manual. Ive been talking about it every day for the last 2 weeks since I found out about it. I am certain it will help me improve! Just reading one of your tips about the variety we should use in our advertisement methods encouraged me greatly. Sorry about the URL. I was using my tablet and didn’t figure it out yet 🙂 https://www.facebook.com/thelittlehomeboutique/?ref=bookmarks I would love any of your tips! expand my reach to customers outside of the immediate area and draw in more people to my store. I have a facebook site, website, and advertise in the local observer. Any other suggestions?? Thanks! * Add a graphic link to your Facebook to your web site. It’s a chore to “find” a shop on FB, so don’t make them do it! Post more than just merchandise so you get more likes and comments. Hundreds more ideas, including exchanging reciprocal links with sites that will make your shop more visible. Start with How To Consign’s Resale Shop Directory. * Check the categories and the topics on my blog for, literally, thousands more ideas, and even better, get the Manual and look through all the other Products for the Professional Resaler we offer. Hi Kate, Thank you for your response. My first question is what is an SEO? I am really not that good with computers, etc. I was paying someone to manage my site but she charges $75.00/mnth and is very busy business owner her self. I can’t afford that right now. So, I thought if I could have someone teach me then I could do it myself. Do you have any suggestions about classes etc that I could attend to learn about how to do this. I did contact a SCORE member and I met with him on Monday. He did a brief evaluation and told me that I should really boost my promotions/events when the snowbirds are back in town. So, I am trying to plan the events but, as far as getting them out there. That’s another thing. Diana, if you highlight any word on the web, you’ll get a choice to search for it (at least, if you’re on a desktop computer… your phone might work differently)… SEO stands for “search engine optimization” and it’s what makes your web site findable by people who don’t know about you. (E.g. winter residents and visitors!) It’s a big topic, as is polishing your web site. As to the suggestion from SCORE, that’s great… you need to make hay while the sun shines and get all polished up for “season” here in Florida. Start planning NOW… promotions planned in haste never return the results you want. You will find, in Resale’s BEST Promotions, not only a planning calendar and ways to get the word out, but ways to make your promotion keep on earning you attention and dollars long AFTER the fact. Thank you for the lovely and inspiring article! My boyfriend (who is very interested in finances and an early retirement for the both of us) keeps insisting that I should follow my passion to be independent and open a shop. At first it was coffee/tea, then books, and now a consignment shop seems to be catching both our attention. We could even sell the former two! Our hopes is of finding a small building with a nice storefront and a garage or work space in the back where we can repurpose and make furniture and misc. I decided on this space that is in a high traffic area, it is zoned commercial, the consignment shop is downstairs and I live upstairs, I am highly stressed with all of the responsibilities and have a limited budget? Any suggestions? I too need to write a business plan, and would like to invest in your book. Hi Theresa, and welcome! It’s always highly stressful to start on a new path, but don’t let that deter you! Suggestions: A: Read the manual. Several times. Front to back then back to front. B: Create a business plan. C: Do it! Assuming, natch, that you have all the pieces in place as recommended in the manual! Can doing a consignment shop like this this be possible? What a good husband you are, SBL, to research this for your wife! I hear you about the fear of leaping off the cliff and giving up a good job. But I also hear a partnership, right? That might enable the women to run a full-time retail business. As would hiring staff until your wife felt more comfortable relying on the business for a living. I am just reading this for the first time. All of the comments and your answers are good information for new and old shop owners. I am interested in opening a consignment shop for men. I only have the idea and want to know what would my next step be. I know I need a business plan. Is there a book will guide me as I go about this journey? Hi Paula, Thanks for asking. I think your first step would be to learn all you can about the business. That means checking out not only my blog here, but all my other resources (see our “Shopkeeper Info” tab ). Once you have determined that consignment is, indeed, for you, there are links on my Links Page to a few sites which will help you build a business plan that will suit not just your specific needs and desires, but also address the issues related to WHY you’re creating the plan… as a personal guide, as a prospectus for loans or investors, etc. Keep in touch, we’d love t hear how you are progressing. My inspiration was my experience i had dress shopping with my daughter. 2.5 yrs ago she was looking for a prom dress and me a 2nd wedding dress. The stores were high priced, and lacked a lot of customer service. We returned home after a day of shopping retail, and I started to look for a consignment dress store. There were none at all. I wanted to have a pretty space to have the dress fitting experience but the prices to be a bit more practical. We did try the craigslist idea but driving half hour to an hour to try on one dress in someones bathroom was weird. So tada, the dress shop was entirely renovated and designed by me, and i had a web designer create my web page. I put in a lot of energy creating my vision and bring it to life. Now it may seem strange to go to someones home but as soon as you enter through our front door, there is a grand entrance area, then off to the right of the entrance, 7 stairs going up to a landing, and my office, then 5 more stairs to the 500sf dress shop. No one has to walk past our bathroom or bedrooms ect. It is very pretty…white wood floors, chandeliers, wainscotting (french provincial style) A large fitting room, a pedestal with wrap around mirrors and an amazing view of the mountains and farm land from the Attic window. My shop is not open to the public, and my shop has no dresses in it. it is by appointment only. I upload each dress to my website. I have around 500 dress at this time! Wedding, Prom, bridesmaid, mom of the bride, flower girl, and all other special occasion dresses. I advertise on FB and word of mouth. I direct girls to the website and have them send me a list of what dresses they are wanting to try on (all the dresses have a name and SKU #) and I have the dresses waiting on the unique rod i have suspended from the Attic’s ceiling for their appointment. I make sure we have fun and very much pride myself with good customer service. If girls are wanting to consign their dress with me they have to email me a photo of their dress, if it is a dress i feel i can sell, i reply with my consignment contract and we set up a time for them to bring it in. It has been a wonderful 2 yrs doing this business on the side. I have just let word of mouth take its course. I have done a few marketing strategies within my community. I have now recently quit my other job and am about to take The Dressy Attic on full time. I came across your amazing story and felt the need to reach out for some help and or ideas to take my small business to the next level and would love any ideas. I don’t think financialy i can afford a store front open to public but would just like to increase my business. Sounds like you’re having a ball, Kristy! An interesting concept, and one that is, I imagine, quite time-consuming and rewarding. Hello Auntie Kate! My name is Tony Mann and I opened a name brand resell store about 5 months ago. I have about 1,000 sq ft and sell everything from infants clothing to plus size clothing. I started out doing great on the weekends because there is a large flea market next door that is open on the weekends that draws in traffic. Unfortunately I have almost no traffic during the week and traffic during the weekend has dropped dramatically. I have a FB business page and do flyers, I have % off sales frequently also but still declining business. I am not sure what to do. I have a very limited budget and the store isn’t as nice as some of the big box stores but I have been told many times we have nicer clothing. I am in desperate need of help please! I also have trouble stocking the items I need that are trending and wanted. I buy clothing on Mondays because of a limited budget. Well I really hope you can help me. This is all I have and I do not want to fail. Thank you for your time. Hi Tony, thanks for being here on the blog! Here’s a few ideas to get you started, as you continue to explore my blog, my web site, and the Products for Professional Resalers for ideas that strike home with you. * Slow traffic: Do you have and use an email list? People need to be reminded constantly of the resource your shop can be for them! * Why isn’t your store “as nice as some of the big box stores”… and what can you do to correct that? * What does buying on Mondays have to do with a limited budget? Would buying all days help you get what you need? As to the limited budget, are you turning DOWN good stuff or being forced to offer so little that the sellers don’t agree…. or are you not letting the folks with the desired goods know what you want? Is your budget so low you are strangling the growth of your business? Here’s hoping that a few of the ideas I offer help you, and here’s hoping, as well, that you will be able to report back here, soon, with some progress reports! I’d like very much to open a furniture resale shop (re-purposed, and re painted items) however I feel like I’d like a partner to work with. It seems difficult to find people with the same interest willing to partner up. Any ideas on how to find others looking for this same venture? Arianna, that’s a very interesting question. Perhaps, if you can define exactly what you envision for this partnership, it might help you find a match. For example, if you are looking for a fellow craftsperson, you might find her or him through your artistic connections in your area. Or, if you are seeking someone who has business, marketing, or financial talents, you’d look in a very different circle of acquaintances. Hi Jamiliah, To appeal to a specific group of potential sellers, first you have to figure out how you can satisfy them, then figure out where they are. Is it the cash that will appeal or the whole idea of “not wanting to carry last year’s bag”? What will these folks expect from you, in order to make it convenient for them? Chances are, they’ll want to sell their bags where, when, and for how much they expect. After you figure all that out, then how do you get your finely-crafted message to them? Through service clubs, workplaces, churches? With neighborhood fliers? As an article in whatever print media is their favorite? Happy Birthday too, early or late! Hi, just a year ago I opened a thrift clothing store for women 510 square feet. I love the store n I love to be there. The only thing the foot traffic is very low. Marketing is high would u have any ideas what else can I do. I done fliers I have a website n a frame. * Keep using fliers, constantly. And be aware of where you distribute these, the message you’re promoting, and the feed-back you get. * Promote your web site on all materials, from those fliers to your business card to your in-store signage. * Is there a place on your site (and in your store!) to sign up for your email list? Do you promote your mailing list in-store… on your desk, with a small note on all mirrors, in dressing rooms? * Send emails 2-3 times a month, and vary the message/ offer… but keep the same look, so your customers are reminded, even if they just skim your writing, of your shop. * Do you promote and use a wish list, AKA a want list? This builds your reputation for service really well. * Create and use a Facebook business page. Your site, your email campaign, and your Facebook can all be integrated, so you don’t have to spend all day on social media! * Send press releases to your local media. And keep on sending them. * Car signage. Name badge: wear it as much as you can, so those all-important “What is YourShop?” conversations get started. Always carry business cards to use during these conversations; a special offer/ coupon-style business card could be very helpful as well. * In-store promo events designed to get regulars in more often, and to bring their friends. This could be as simple as a new-season preview or Girls’ Night Out, or as planning-intensive as self-improvement lectures of fairs. Don’t forget the social media, fliers, and press releases on your promotions! Best wishes, and let us know how it goes! Hi I’m a 34 year Cosmetologist who still loves doing hair. I also love thrift and resale. What do you think of combining a salon and Resale/Thrift Boutique? I started writing my business plan today and have to find the right space. I think the two businesses would benefit off each other. Maria, I have heard of such combos before, and of course if you’re considering selling womenswear it’s a natural fit! Let us know how it progresses! Do you have any names/contacts of such businesses? I’d love to reach out for feedback. on August 3, 2014 at 12:26 am | Reply E.j. I am growing despondent in my current career and want to start a speciality consignment shop. I have identified a space very busy middle class neighborhood but the management company is charging an exorbitant amount in rent. I am conflicted about the whole deal because it is a great location but I am afraid that I might not be able to meet my bills with a rent of $4000 per month. Any suggestions? Hi E.j., and welcome to the wonderful world of consignment! Have you done your research, read the manual, and penciled out a business plan to see what rent would be doable? Whether $4000 is workable or not depends on traffic patterns, price level of the merchandise you will be selling, and of course on the size of the space. As in any new business venture, having 6-8 months’ of business overhead and personal living expenses available for use if needed is vital: you certainly don’t want to throw your heart and soul into a business then have it fail simply because you couldn’t afford the time to let it grow. Let us know of your progress! Hi bdoor, Congratulations! You’re brave… we ALL felt the same, scared about whether we’d make it or not. How long will it take before you make a profit? That’s up to you, and how smart you work, isn’t it. I’m so glad you found us! I was so excited to see this post. I recently became the director of Tri-Village Trading Post, a resale/thrift shop in the parking lot of First Community Church (First and Cambridge) in Grandview Heights!! I am not originally from Columbus so I didn’t know the history of One More TIme. I just subscribed to your communications and can’t wait to learn from you! I have already changed the Trading Post quite a bit since it’s been in existence for 61 yrs. and not much had changed. I have a lot more to do however. If you’re still in Columbus area-stop in – I’d love to meet you!! Well I’ll be, Rebecca…. The Tri-Village Trading Post and FCC! I well remember my sister volunteering me to help price at one of your big events… me, who priced day in and day out! Give my regards to the TriVillages, I loved my 30 years in the community! Thanks for your comments, Janet. Sounds like you are just beginning to get your plans together. I would recommend that you start with Too Good to be Threw Complete Operations Manual, which will help gel your plans, and then explore the additional Products for the Professional Resaler that will help. Best wishes, and let us know how it goes! I opened a consignment store in a small town and after our first year business is great! It has far exceeded anything I could have imagined. I am always looking for ways to make my shop even better and reading your blogs has been an excellent source of information. I would be interested in anything that you would suggest to keep our store fresh and unique. We struggle with keeping up with inventory and becoming too full and taking too long to get items in. Any suggestions or materials you have for sale would help us? Welcome, Lisa! My blog here is just a taste of all my materials which you can use… and in most cases, download to your computer Preety Darn Quick… hence, PDQs! Check out my manual, Too Good to be Threw Complete Operations Manual for Resale & Consignment Shops, at TGtbT.com/manual.htm, as well as all the other Products for the Professional Resaler at TGtbT.com/shop.htm Sounds like Your Moneywise Guide to Accepting and Pricing at http://tgtbt.com/shopbuild.htm#25 might be just what you need right now! And kudos for you for continuing to learn and grow your business! Hi, I’m 25 years old a single. Mother of 3.my dream is to open a consignment shop with a craft area for children I live in a smaller town and there is .nt much for children to do so I think it would be great! But I need guidance on where I need to start. I have great family support and a best friend willing to do anything I need from her. We would be more of business partners. Any advice or help you could give me would be great . Thanks brittney. Welcome, Brittney, glad you found us. Please feel free to investigate my manual, Too Good to be Threw Complete Operations Manual for Resale & Consignment Shops, at TGtbT.com/manual.htm, as well as all the other Products for the Professional Resaler at TGtbT.com/shop.htm And best wishes on your new venture!